Next, we are going to create a ‘thing’ which is the virtual equivalent of the physical device you want to control. For this example, let’s imagine that we want to control a water pump in an industrial facility. You can now see details on your newly created ‘thing’ and in the right panel, you can see that it has no state. 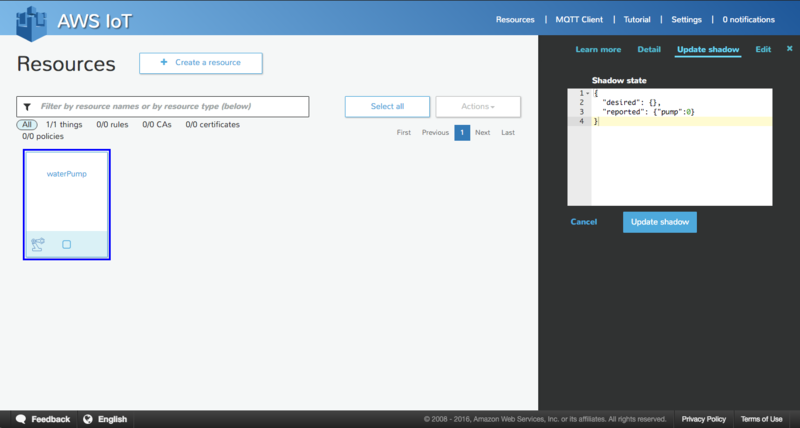 In the right panel you can see information on the ‘REST API endpoint’, make sure you copy this value as we will need it later on. With AWS IoT you can create a persistent, virtual version, or ‘Shadow state’ of each device that includes the device’s latest state. This allows applications or other devices to read messages and interact with that device. Device Shadows persist the last reported state and desired future state of each device, even when the device is offline. Alternatively, you can retrieve the last reported state of a device or set a desired future state through the AWS IoT API. AWS IoT will compare the desired and last reported state, and command the device to make up the difference. Device Shadows make it easier to build applications that interact with your devices by providing always available REST APIs. 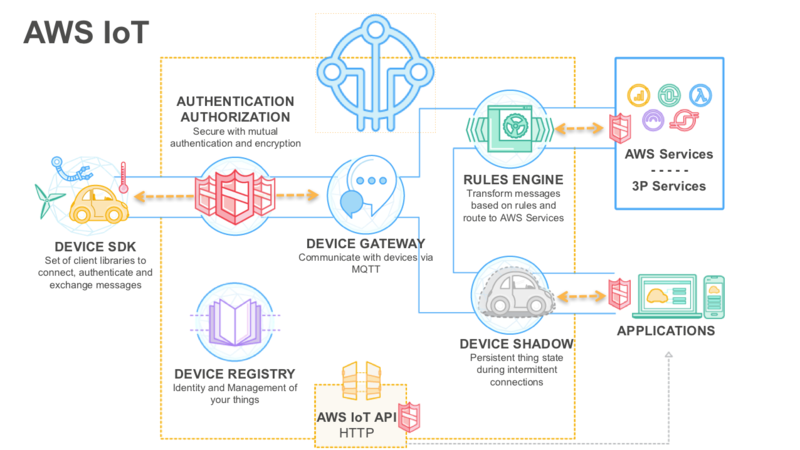 The AWS IoT Device SDK makes it easy for your device to synchronize its state with its shadow, and to respond to desired future states set via the shadow. You do not need it for this tutorial as we will not focus on the code that would be located on the physical device. If you have a physical device you wish to connect you can follow these instructions. Now, we have a ‘Thing’ called ‘waterPump’ and it has a shadow. We are going to use them to change the state of our water pump. The water pump can either be inactive (not pumping any water) or active (pumping water). We will focus on how to change the Shadow state of a device using an Alexa skill. 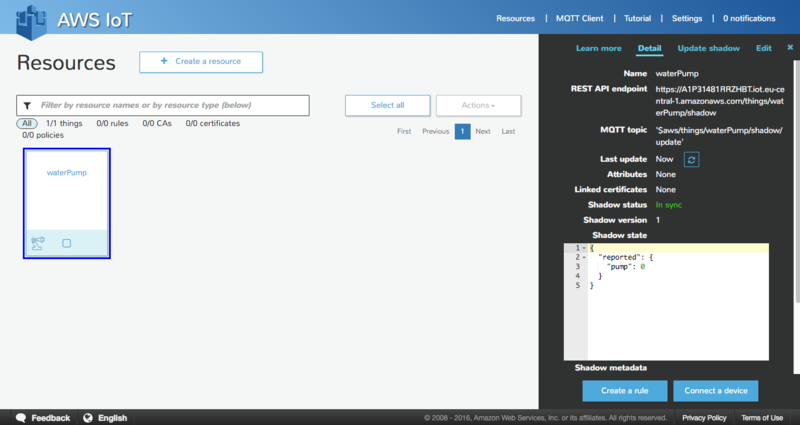 To make things easy we are going to simulate having connected a physical object with the AWS IoT Device SDK and the state of our device. You should now see that the Shadow state contains the updated state, which shows in the reported section that the pump is inactive (value of 0). 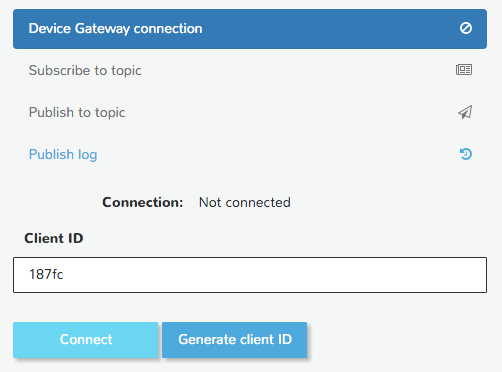 This step simulates having a physical device connected to AWS IoT. If we had a physical device with an inactive pump, it would have published the same state thanks to the AWS IoT Device SDK and we would have the exact same information in our Shadow state. The ‘reported’ section is meant to be updated by the physical device only. We are showing you how to do it, in case you don’t have a physical device to connect. To control a physical device, you need to update the ‘desired’ part of the Shadow state using the AWS IoT API. In our case we will use our Alexa skill to update the ‘desired’ section of the Shadow state using the AWS IoT API from AWS Lambda. Once you are familiar with the Alexa Skills Kit and understand how to create an Alexa skill, you can use the following pieces of code to change the Shadow state of your Thing and thus control your connected device. Place the following code at the top of your AWS Lambda function to load the libraries we are going to use, replace the endpoint with the ‘REST API Endpoint’ value you copied earlier. Mind the fact that you need to extract only the following part: XXXXX.iot.us-east-1.amazonaws.com. Then you can place the following as a function to be executed when your intent triggers, more precisely when the ‘onIntent’ function is referenced inside the Alexa Skills Kit template. To test the whole configuration we will place ourselves inside the device’ shoes. When a user is using your skill it will trigger an update to the AWS IoT Device Shadow. In this instance it will update the ‘desired’ section of the Device Shadows to control your device and will update the value of the pump attribute to 1 to activate the pump. 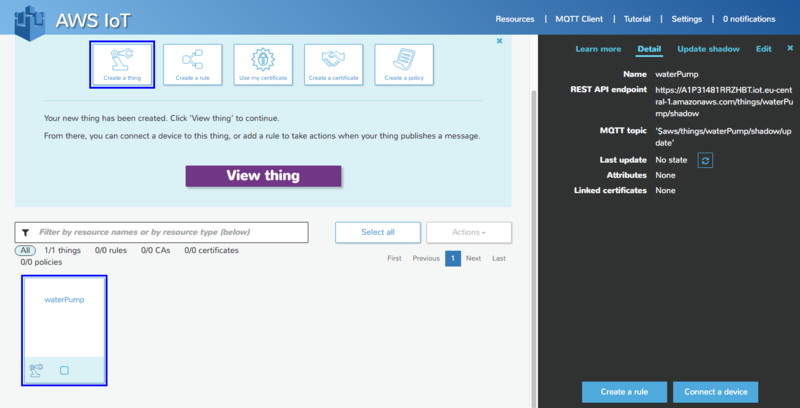 When that happens the AWS IoT service will send multiple notifications in the form of MQTT (MQTT is a publish/subscribe known protocol in the IoT space) messages on reserved MQTT topic so your device can listen to them. Physical devices can directly catch the delta existing between the ‘desired’ and ‘reported’ state and act accordingly. For instance, the device will catch the delta and see that the pump needs to be activated, and then activate it. You can now use the Alexa Voice Simulator in the developer portal or an Alexa-enabled device, such as the Amazon Echo, Echo Dot, Amazon Tap or AlexaPi, to use your skill and activate the pump with your voice. 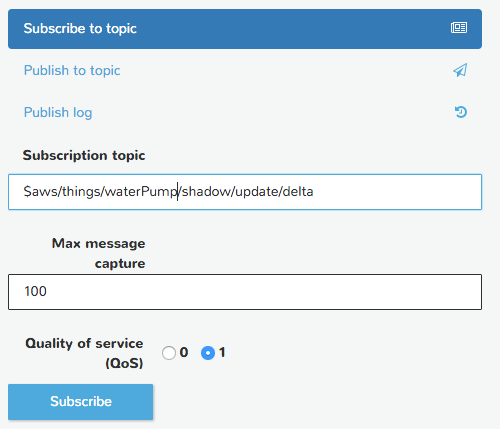 You should instantly see the delta (difference between ‘desired’ and ‘reported’ state in Device Shadows) being pushed to the MQTT topic you are listening to. If you have a physical device, the notification would be delivered to it too. You are now able to build voice-enabled IoT applications using ASK and AWS IoT. Device Shadows will give you the ability to retrieve the last known state of your device and to control it. To dive deeper, you can use Alexa and AWS Lambda with the rest of the AWS Platform to add high value services like making use of Amazon Machine Learning or running analytical queries with Amazon Redshift. To learn more about AWS IoT, you can take a look at this session from AWS Re:Invent. Many other sessions or webinars are also available.